I finished my yearly rewatch of The Lord of the Rings this week. I watched The Fellowship of the Ring (my favourite in the trilogy) on Monday, The Two Towers on Tuesday, and The Return of the King on Wednesday. These were the theatrical editions because while I own and have watched the extended editions a couple of time, it’s the theatrical editions that I love the most – because it’s those versions I saw in the cinema and fell in love with. The Lord of the Rings is inexplicably linked to Christmas to me. That’s because when each film was released, me, my mum and my gran would go together to see each one on Christmas Eve. It was a family tradition for three years and I loved it. Now I always rewatch The Lord of the Rings in December, as close to Christmas Eve as possible. When I was at university and had longer holidays and less to do in them, I even watched all three films on one Christmas Eve before. Now with work and having to travel home for Christmas, I can only do watching one per evening, three nights in a row. I love every film in the trilogy, but my absolute favourite is The Fellowship of the Ring. I think I love that one so much because it is kind of the most light-hearted of the trilogy. It’s the one that introduces all the big characters, is more hopeful but it also has some scary moments and brilliant battles. The Mines of Moria sequence is one of my favourites in the whole trilogy, both the battle and the chase to the bridge. Also love the Skirmish at Amon Hen at the end of the film. That’s a brutal battle but one that’s so motivated by the characters you’ve grown attached to over the course of the film. While the Battle of Helm’s Deep is fantastic, and I always get goosebumps when Haldir and the elves arrive to help, I think The Two Towers is my least favourite. That’s because I don’t love Frodo and Sam’s plot until they meet Faramir but I like the Merry and Pippin stuff with Treebeard and I adore seeing what Aragorn, Legolas and Gimli are doing. That doesn’t mean to say The Two Towers is bad, it’s still immensely enjoyable and does a great job of reintroducing all the characters we’ve already met and setting up the importance of Rohan and its people in the first 20 minutes – that’s a great screenplay. The Return of the King is the perfect end to a perfect trilogy. I love every character’s plot; the battles are phenomenal, and the story is so full of hope. Yes, it has a dozen endings, but I love every single one of them and they send me on an emotional rollercoaster. I love The Lord of the Rings trilogy because of the way it makes me feel. It’s got nostalgia value for me as it was such a formative influence on my taste in films and stories, so every time I watch it it feels like a warm hug. I’m still constantly surprised that no matter how many times I watch the trilogy (this year was my 14th full trilogy rewatch) there’s still little things that I notice and that bring me joy. The Lord of the Rings trilogy just makes me happy. It makes me smile, makes me cry, and I still get completely taken in by the battles and the whole world of Middle Earth. I love it so much and I don’t think I’ll ever be able to put into words how much I love these films or how much they mean to me. It’s been a while since I’ve done a Book Tag but as it’s blogmas and I’m looking for blog posts, here’s a seasonal appropriate one. This tag was created by Girl Reading on YouTube and I came across it via Bookables video. 1. A fictional family you would like to spend Christmas dinner with? Is it cliché to say the Weasley’s? Because they are the first family I thought of and I can’t think of a better fictional family to spend Christmas dinner with. 2) A bookish item you would like to receive as a gift? If we’re talking about items from a book, could I get a Time Turner? That’d be very handy. Or bookish items in the real world, I’m a big fan of book sleeves. I love there’s so many designs and companies out there. I have two from BookBuddle which I love, and I received a Black Panther one in a subscription box which is very relevant to my interests. 3) A fictional character you think would make a perfect Christmas elf? Samwise Gamgee. He’s so kind, helpful and thoughtful that he’d make a great Christmas elf! Plus he’s resourceful so if there was any mishaps, he could sort it out quickly. 4) Match a book to its perfect Christmas song. I find this kind of thing really difficult but after a lot of thinking I came up with Step Into Christmas by Elton John to be paired with The Martian by Andy Weir. My thinking is, it’s just the kind of song that Mark Watney would be stuck listening to months on end. 5) Bah Humbug. A book or fictional character you’ve been disappointed in and should be put on the naughty list? I read the Chaos Walking trilogy by Patrick Ness this year and was so annoyed by Todd through the entirety of the first two books, and then through a good chunk of the third book too. He disappointed and frustrated me with his naivety so he’d be on the naughty list. 6) A book or a fictional character you think deserves more love and appreciation and deserve to be put on the nice list? The Murdstone Trilogy by Mal Peet. It’s a completely bonkers fusion of fantasy and real life and when the line blurs between fiction and reality it’s a lot of fun. I don’t know anyone else who has ever read this book so it definitely needs more love – or at least, I need to find people who have read it to talk about it. 7) Red, Gold and Green. A book cover that has a wonderfully Christmassy feel to it. 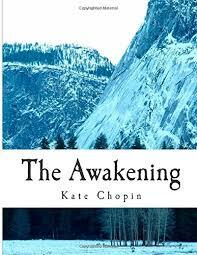 Now this one I found really difficult and I thought I was going to skip it as I didn’t think I had any books with Christmassy covers (mainly because I don’t tend to read books set at christmas time) but then I remembered by copy of The Awakening by Kate Chopin. I haven’t read this book yet (it’s been on my shelves for years though) and while it might not be exactly Christmassy, it’s definitely wintery with all the snow and mountains. 8) A book or series you love so much, you want everyone to find under their Christmas tree this year, so they can read it and love it too? As the spin-off is coming in the New Year and I’m so excited, I’m going to have to say the Inheritance Cycle by Christopher Paolini. I think Eragon, and The Lord of the Rings films, was my gateway into fantasy. I’ve reread the Inheritance Cycle a few times over the years and I still love it. I tag whoever wants to do this tag! It’s mid-December and that means only one thing – film award season is heating up. Award season is interesting to say the least and it can be annoying, overwhelming and relentless. I do have a vague interest in award season and what films get nominated for Golden Globes, SAG awards, Oscars and everything else. Part of it is because I’m a part of #FilmTwitter as there’s no escape from it all. It can be annoying and all the arguments when different films are slated or snubbed or praised can make me dislike a film. Which of course is not a good thing because the film should be judged on your viewing experience of it, not what awards it has or hasn’t been nominated for or what other people think about it. One year when I was at university, I think it was the 2013 to 2014 awards season, I decided to try and watch all the films that would be nominated for Best Film, Best Director, Best Actor and Best Actress at the Oscars. Living in the UK that meant that I would get the “Oscar bait” aka all the films that was likely to be nominated for the big awards a month or two after America. It was an interesting experience but not one that I want to repeat any time soon. I watched films that I wouldn’t normally watch. For instance, Nebraska which I can’t remember anything about and August: Osage County and the only thing I remember about that film is disliking every single one of the characters. 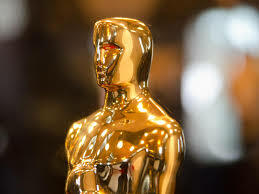 Attempting to see all the films that will get Best Film, Best Director, Best Actor and Best Actress nominations was something I did to be able to say, “I’ve seen that film!” and when the nominations actually came out, I could have an opinion on all the nominees in a category. Now though, I can’t be bothered to be honest. I would rather watch films that I think I’m going to enjoy or are something I want to see no matter what nominations it does or doesn’t get and while there can be some very enjoyable and interesting “Oscar bait” films I don’t want to force myself to watch them if I don’t want to. I think this time of year with all the awards it is sometimes just a bit much. Everyone has an opinion and there’s so many films out there, so naturally some of the films and the performances that are being talked about I haven’t seen but now I don’t feel that I must catch up. That’s because the films or performances are ones I don’t want to watch or are in horror films or are other genres that I’m not interested in and am 99% sure I won’t enjoy. I’ll admit I’m a bit surprised that Widows isn’t getting more nominations, as I thought the performances and script were top notch, but I’ve learnt not to get too caught up in awards season. 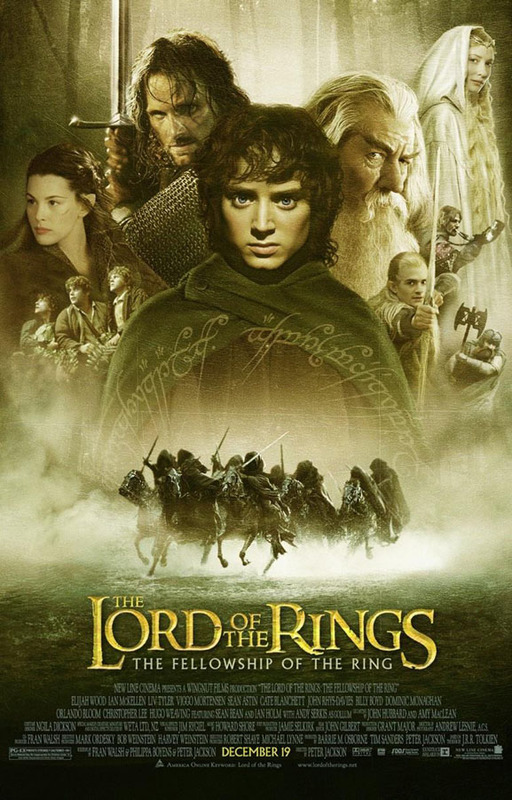 Though, I do readily admit that I love that The Lord of the Rings: The Return of the King is one of three films (the other two being Ben-Hur and Titanic) to have one 11 Oscars and, I believe, is the only film to have one an award in every category it was nominated in. But besides that little titbit, I’m not going to let awards season, and the 2019 Oscars, get me down. Do you try to have an opinion on every film that gets nominated for the big awards? Or does Oscar-season just pass you by? BOOK BLOGGER HOP: If you could travel back in time to purchase the first printing of a specific novel, what book would that be? It’s been a while (about a year to be honest) since I’ve last done one of these, but they are fun. The Book Blogger Hop is a weekly feature hosted by Coffee Addicted Writer, to find bookish blogs and to learn more about the bloggers themselves. You can find more info on the feature here. This week’s question is: If you could travel back in time to purchase the first printing of a specific novel, what book would that be? Now that’s a good question! I’m not too fussed about covers and editions (though I do prefer all books in a series to match) but, if I could, I think I’d want to get a first edition of The Lord of the Rings: The Fellowship of the Ring. It’s my favourite book in the trilogy and I think it would feel really special having that book sitting pride of place on my shelf. Is there any book you’d want a first edition of? Top 5 Wednesday is a great feature hosted by ThoughtsonTomes. To find out more about Top 5 Wednesday and the upcoming topics, check out its Goodreads page. This week’s topic is in honour of the Booktube SFF Awards and instead of focusing on books, we’re talking about our favourite science fiction and fantasy in other media, whether that’s TV or Film. Me being me, has gone for film and here are some of my favourites. If you’ve not watched Moon you really should. It’s a small-scale sci-fi film that sometimes feels claustrophobic, but that just adds to the underlying tension running throughout the film. Moon is eerie and gripping and Sam Rockwell is fantastic. It’s a film that’s lodged itself in my brain from the first time I saw it. While I do feel this franchise has gone on far too long and has generally gotten worse, I do love the first Transformers film. It’s one of my “comfort” films, if I feel down for some reason I’ll put it on and the over the top characters and action cheer me up. The battle in Qatar’s desert between the US military and a Decepticon is one of my favourite action sequences ever. Top Ten Tuesday is a feature run by BrokeAndBookish each week. This week is a movie freebie so you can write about whatever you like, top ten all time favorite movies, top ten foreign films, top ten rom-coms, whatever! I thought this would be the perfect time to talk about the films I can watch over and over again and no matter how many times I watch it I never get bored. So while obviously The Lord of the Rings is actually three film I count the trilogy as one since it is one big story. Every December, as close to Christmas Eve as I can get it, I rewatch the entire trilogy in a day. It’s a little tradition I’ve been doing for over ten years and I can’t wait till it’s December and I can watch Lord of the Rings. I count these two as one film too because they follow so well from one another – plus there’s no third film. These films feature one of my favourite fictional couples and my favourite fictional family ever! The O’Connell-Carnahan’s with Ardeth Bey are just the best! 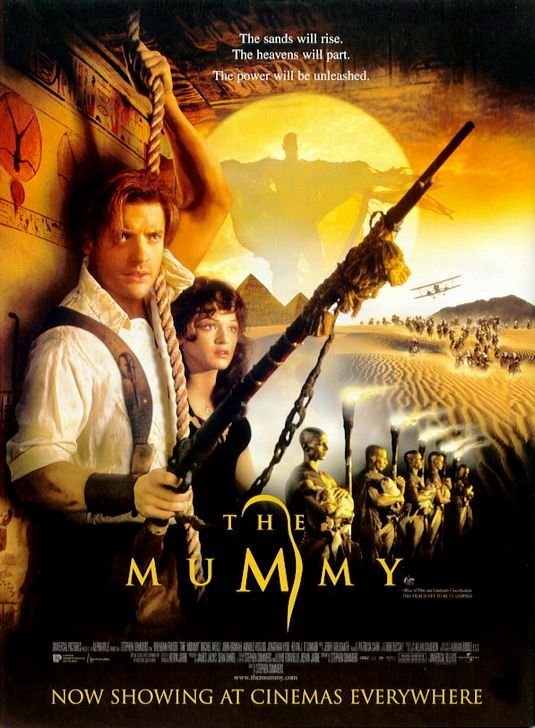 The Mummy and The Mummy Returns are so much fun and full of adventure and I could never get bored of watching them. I moved into a new place recently and one of the things I was most looking forward to was that in my bedroom there was one completely empty wall I could do anything with. 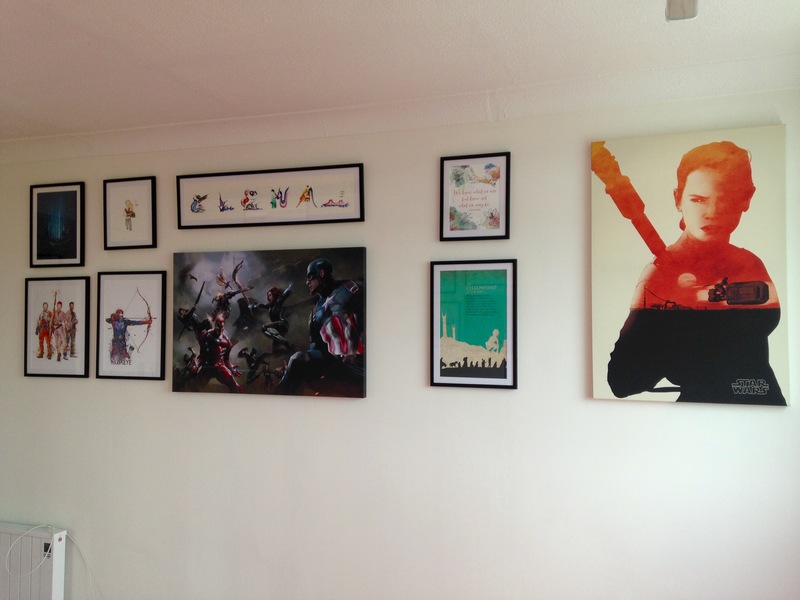 So naturally I wanted to get my various fandom-related pictures, posters and prints framed and hung on the wall. I absolutely love how they all look so I just had to brag about them, but I will be nice and share where I got them from so if any get your fancy you know where to go.